Of the bits released in the No7 Summer Collection the gold-flake lip balm didn’t get me quite as excited as the other bits (the bronzer and eye shadows in particular were v.exciting) but after having a bit more of a play with it I decided it is actually a lovely product – but if you want one you have to rush, I think the S/S range is only in Boots for a couple more days! The balm is almost jelly-like in texture in my opinion, quite firm on first touch but when you push your finger in it feels like a thick liquid. The colour (golden rum – also available in a peach colour that looks really pretty) doesn’t really show on the lips, but when layered over a lippie it does enhance it. 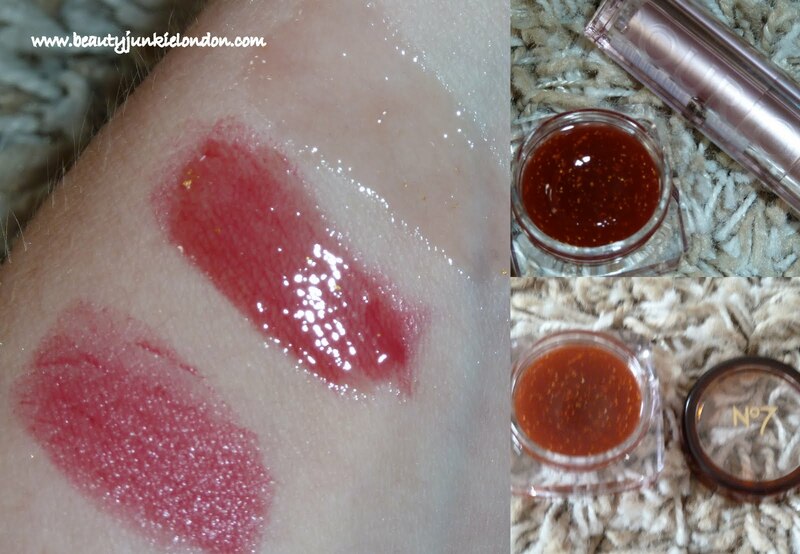 The golden flakes are subtle and fairly inconsistent through the gel, you can just about pick them out in the middle swatch in the picture, they show better over colour. Personally I think it would have been just as good a product without the sparkle bits. Best thing about this gloss – that it delivers tons of shine, but feels non-sticky and weightless. Lovely stuff. The picture below shows a swatch of the gloss alone, and a swatch of one of the new Bourjous Sweet Kiss Lippies in ‘fuscia adent’ – the swatch in the middle is the gloss on top of the lippie swatch – it really enhances the colour and gives it a …pop! Both the lippie and the gloss were provided as PR samples.